Natural Insight provides cloud-based workforce management software to merchandisers, product companies, event marketers, and retailers. Their product helps 85,000 hourly workers complete 500,000 tasks in 100,000 work locations each month. With such huge volumes of information, Natural Insight came to us looking for an easier way of analyzing the data derived from the hundreds of thousands of surveys being submitted on their systems each month. 3Pillar worked with Natural Insight to standardize their survey process for easier data aggregation and generation. We worked with Natural Insight to develop a data-hosting platform that would help users make quick sense of their data. Clients can easily access their events calendar to see what is coming down the pipeline. The platform also has an upgraded survey tool, which allows for easier user engagement and data collection. Our team conducted over 20 user interviews and went through multiple rounds of prototyping and testing to come up with an unexpected solution that changed the way the data was organized while also changing the way it was being collected. Working closely with Natural Insight, our team helped revamp their platform by creating a new survey template creation tool, a question library, and a data-rich dashboard. This has made life easier for Natural Insight and their customers on both ends of the process. Natural Insight can easily create surveys and collect and understand data, and their clients can easily create and consume reports on their data to tweak their processes. The new platform gives users quick insights into all of the data that they are collecting and analyzing. The results? 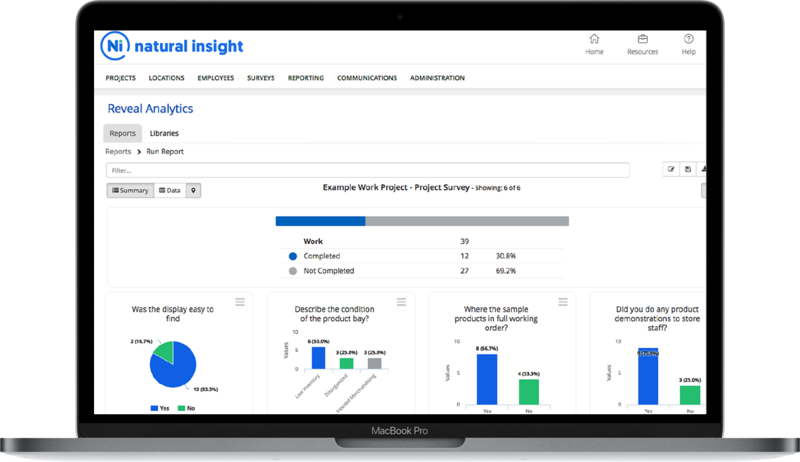 Natural Insight’s revolutionized, next-generation platform has been used to manage over 35 million assignments and collect almost a billion data insights from field workers. 3Pillar continues to serve as one of Natural Insight’s product development partners to build out their core and supplementary products.